EJ was proud of both his Western New York roots -- he was born in Buffalo -- and his alma mater, the State University of New York College at Brockport, where he graduated with a degree in physical education and health science in 1975. He played for the Brockport Golden Eagles from 1971-72 through 1974-75, where he was known for his leadership skills, gritty style of play and the work ethic that he brought to the rink on a daily basis. He served as team captain during his senior year. EJ was the ultimate team player, and no better evidence could be found of this than in his senior season when he set a single game school record with five assists. EJ reflected years later on his hockey playing ability: "I knew that playing hockey was not the avenue to stay in the sport I loved," he said. " 'You may be small,' my coach at Brockport told me, 'but you're also slow!' "
Following his undergraduate studies, EJ remained at the school to complete his Master's Degree in Physical Education ('77) and got his first taste of coaching as an assistant with the Golden Eagles for the next two seasons. In 1977, he assumed the head coaching duties at Brockport while also serving as the school's Assistant Director of Athletics, a position he held until 1982. He was largely credited with first saving and then providing a stable foundation for the hockey program that, in many ways, helped to grow the sport at the youth levels in Western New York. Earlier this year, quietly and with no fanfare (the EJ way), he returned to his Western New York roots and teamed up with his lifelong friend, Gene Overdorf. Overdorf, the coach at Bishop Timon-St. Jude High School, had invited EJ to share his wealth of hockey knowledge with a bunch of teenage hockey players. As the Metro Community News of Buffalo reported after the visit, "EJ came out to talk to the young men about what it takes to make it to the next level. McGuire, however, just didn't chat with the boys, he also helped to run practice -- the same way NHL teams run practice." EJ's impact on hockey in Western New York and the Brockport school community, both on and off the ice, was appropriately recognized on Sept. 26, 2009, when he became the first member of the hockey program to be inducted into the Golden Eagles Hall of Fame. His pride in how far the game has come in recent years was clear when he remarked during the recent World Junior Championships in Buffalo: "I think the sky's the limit for the city of Buffalo, for Western New York and extends right through Rochester. I really think not only are more and more kids going to come out of here, but stay in Buffalo longer to play." A chance encounter with Mike Keenan in the summer of 1980 at a coach's symposium north of Toronto led to a special bond between two young, aspiring hockey coaches. Keenan was passing through Toronto on his way to Rochester, N.Y., and stopped by the symposium to confer with fellow coaching friends Roger Neilson, Harry Neale, Ron Smith and Tom Watt as he considered signing his first pro coaching contract with the Rochester Americans (AHL). Eight years later, as the pair prepared to coach the Wales Conference in the 1988 NHL All-Star Game in St. Louis, EJ reflected on how their relationship evolved. "The fact that Brockport was only 15 miles from Rochester caught Mike's attention," McGuire said. "On the hurried walk to his car, with travel bags over both shoulders, we started talking. I was astounded by the amount of information that Mike was able to elicit and retain. I initially assumed all he wanted was a friendly exchange -- to get my attention on the Rochester area, its level of hockey sophistication. Four months later, in September, I heard from Mike again. He phoned my office, as urgent and direct in his approach then as he had been in our first conversation." Keenan was looking for a stats man and EJ recommended a member of his staff from Brockport. "And from my supervision of that statistician as a contributor to Keenan's first pro season, my relationship with Mike evolved -- from an interested observer of his team, to a hockey knowledgeable outside opinion, to an advance scout of upcoming opponents, to a coaching cohort and friend," McGuire said. EJ would work on a part-time basis for Keenan in Rochester for the 1981-82 and 1982-83 seasons. The pair won an AHL championship (Calder Cup) with the Americans in 1983. In 1983, it was time to go north of the border from the Brockport experience as a student, player, coach and administrator and the Rochester "jack of all hockey trades" experience to the University of Waterloo (Ontario), where McGuire began his doctorate studies in kinesiology (with a sports psychology specialization). He would also coach the university's hockey team. Over the course of the next six years, his passion for coaching and education helped him to reach the pinnacle in both pursuits. First, connecting again with Keenan as an assistant coach in the NHL with the Philadelphia Flyers (1984-85 through 1987-88), and later with the Chicago Blackhawks (1988-89 through 1990-91). The McGuire-Keenan coaching partnership was one of the most successful in the League during that seven-year stretch, producing five division titles, two trips to the Stanley Cup Final (1985 and 1987) and a combined record of 307 wins, 199 losses and 54 ties. 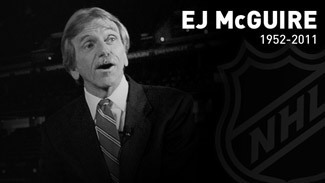 The four years in Philadelphia were a special time for EJ, as the Flyers brought several innovations to the coaching profession, including EJ being a pioneer in using computers to log player movements and statistics. The Flyers' staff of assistant coaches was the largest and most specialized in the League with EJ and Paul Holmgren involved in the day-to-day operations on the ice, communications with the players and the scouting and preparation for the upcoming days. Goaltending instructor Bernie Parent worked with every goalie in the Flyers organization, while special assignment coach Bill Barber helped the forwards perfect their offensive skills. Physical conditioning coach Pat Croce kept the team in shape and advised on nutrition and energy, while even GM Bob Clarke and TV analyst Ed Van Impe would take to the ice to lend their expertise. For the cerebral McGuire, the thrill and challenge of being on the cutting edge of hockey technology was a "daily rush." Computers were used to process player data, for everything from shift length to a nutritional analysis of how players' diets affect their stamina and performance. Video, which had been introduced as a coaching tool a few years earlier by Roger Neilson, was further advanced by EJ as he used it to analyze player performance and pre-scout upcoming opponents. Just one example of his meticulous attention to detail: EJ liked nothing more than to analyze the length of time it took for opposing players to get off their slap shots. Away from the rink, EJ's commitment to every pursuit he undertook and passion for education culminated in 1990 when he received his doctorate in kinesiology and sports psychology from the University of Waterloo. In the 20 years since, he has published several journal articles and book chapters, plus presented at dozens of academic symposia in the psychology of coaching. He also found time to share his unique knowledge of the game at countless coaching clinics across the United States and Canada. Despite the success with both the Blackhawks and the Flyers, EJ left the NHL in 1991 to assume the head coaching duties with Boston Bruins' AHL affiliate, the Maine Mariners. Well known in hockey circles for his quick, dry wit, he explained the move at the time this way: "I'm on record as saying I want to be a head coach in the NHL. To be a head coach in the NHL I have to shed two myths. One is that I can't be a bench coach, and the other is that I could only caddie for one golfer (Mike Keenan)." After just one season in the AHL, the NHL came calling again for his unique coaching skills, particularly in the area of video. McGuire joined the expansion Ottawa Senators and the staff of head coach Rick Bowness, spending three seasons there. A coaching resume that had already included NHL, AHL, NCAA and Canadian University entries had room for one more when, in 1995-96, EJ took over as the head coach of the Guelph Storm of the Ontario Hockey League. The pro game beckoned yet again in 1997-98 when he assumed the head coaching ranks with the AHL's Hartford Wolf Pack, plus performed scouting duties for the parent New York Rangers club. In the fall of 2000, with his close friend Shawn Walsh battling cancer and forced to step down from his coaching duties with the University of Maine Black Bears, EJ stepped in and volunteered his services as a "guest" coach. Next, EJ was hired as a Flyers assistant for the second time on Dec 15, 2000, serving in that role for the subsequent one-and-a-half seasons under head coach Bill Barber. In 2002, EJ took his pro scouting experience with the Flyers and Rangers to the National Hockey League when he joined the NHL's Central Scouting Bureau as an assistant to then Director Frank Bonello. In 2005, he assumed day-to day responsibility for the department that has advanced significantly under his watch. EJ spearheaded an operation that provides scouting and evaluation of draft-eligible players to NHL member clubs. He led a team of eight full-time and 15 part-time scouts throughout North America. To report on prospects playing in Europe, EJ also worked closely with Goran Stubb and his staff of six scouts at European Scouting Services based in Finland. Combined, the NHL Central Scouting and European Scouting Service sees in excess of 3,000 games each season. Just as he brought innovation to the coaching profession throughout his career, EJ was responsible for several advancements in the area of scouting during his nine years at the League, including the development of a new scouting technology system that has brought the "art" of scouting to a whole new level. He was instrumental in raising both the effectiveness and profile of the League's annual scouting combine. At the end of the day, though, it was the love of being in a hockey rink that mattered most to EJ. To know EJ was to hear him describe what his "perfect" hockey day entailed during recent years as the head of the NHL's Central Scouting Bureau: "Going to Brampton this Sunday afternoon to catch the Battalion and Kingston at 2; hope that traffic on the 401 is not too bad so I can be in Oshawa (a 45-minute drive) for the 6 p.m. tilt between the Generals and Petes; and then will be in the video room (a 40-minute drive to League's Toronto office) to help Murph (NHL Senior VP Mike Murphy) for the 9 p.m. Blues vs. Canucks game." That routine was joyfully repeated day after day, week after week, from the time the puck was dropped in September through the NHL Entry Draft the following June. Gary Meagher is the NHL's Senior Vice President of Communications.